Cowslip (Primula veris): growing, planting, caring. One of the first - if not the first - flower to bloom in Spring! Full description for Primula veris not yet available. Primula veris, called cowslip, or primrose officinale, has a basal rosette made of leaves 5 to 15 cm long and 4 cm wide, oval, almost heart-shaped at the base of the limb, borne by a winged petiole. The light green limb is a bit wrinkled, and slightly serrated. It wears a short rhizome on which each year a bud produces a new rosette, which branches out gradually to form a tuft. The clustered flowers are formed of a chalice shaped in a curved whitish and hairy tube from which emerge 5 petals welded in their base, dark yellow with a small orange spot in the center. The cowslip loves a clay soil, with limestone, low in organic matter and it requires sunshine for several hours a day. To install it in the garden sow it in right in open soil, in sunny situation, and on a "clean" ground. The germination is easy, and the seedlings quickly recognizable by the green color of the small wrinkled leaves, flat on the ground. Sown in spring, the plant will be flowering the following spring. Sprouting in August sometimes produces spring bloom, but the plants are small. With the years the primrose feet will grow. They are nicer planted in groups and resurrect spontaneously without becoming invasive. Loving poor land, it is better to avoid fertilizer. Prepare the soil by digging (to decompact without necessarily turning it, with a pitchfork or broadfork), a scratching and raking. 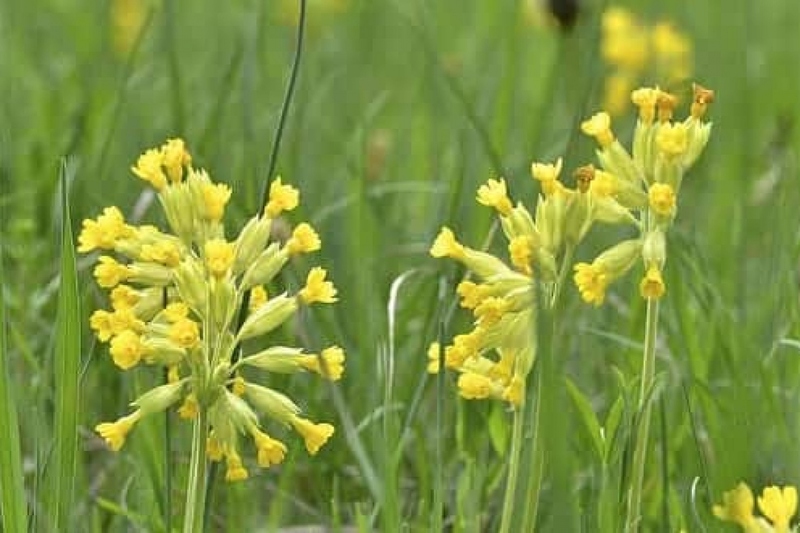 Plant the cowslip at a spacing of 1/3 of the adult height between the plants. Thoroughly tamp the soil so as not to let air in contact with the roots, then water abundantly. If the cowslip are installed in pots or in a relatively sunny location, watering should be done regularly: they need a fairly moist soil to grow. Propagate by dividing the tuft every two to three year. Each year, in the summer after flowering, take the plant out of its pot or its planter, and repot by changing part of the soil, and detangling the roots. Ideally, it should be repotted in a larger container. Primrose is very popular with slugs, red spiders and aphids. It is also susceptible to gray rot and rust. As soon as the flower buds appear until the flowers blossom, give a fertilizer for flowering plants every 10 days; tomato fertilizer is also very effective.